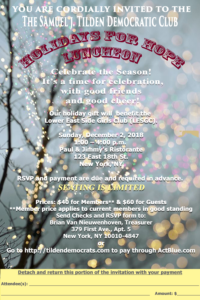 Membership meeting this week and holiday party next Sunday. Hope you had a wonderful Thanksgiving! A few reminders. It’s time to renew your Tilden membership! 2019 Membership application. Please note you can pay by check or online here but you must refill and return the paper application annually. Follow the links above to find the application as well as pay online. Samuel J. Tilden Democratic Club shared an album. What a fabulous night! Thank you to all who came out to support Tilden! Samuel J. Tilden Democratic Club added 61 new photos — with Sandro Sherrod and 4 others at The National Arts Club. Samuel J. Tilden Democratic Club is with Louise Dankberg and 2 others.